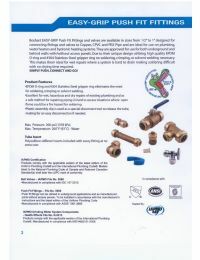 The Easy-Grip 3/4 Ball Valve is a forged brass ball valve that allows you to connect to Copper, CPVC, and PEX Pipe. This ball valve is approved to be used underground and behind walls without access panels and meets UPC, NSF/ANSI 61 code, IGC 157, and Uniform/International Plumbing code requirements. Not for use with PEX-AL-PEX or PEX tubing with an oxygen barrier.